If you often have friends and family over for backyard cookouts, it’s important you know how to grill safely this summer. By following a few of the most basic best practices for grilling, you’ll be able to keep your next gathering as safe as possible. Read on for eight tips to keep your grilling under control. Your grill should always be 10 feet or more away from the house. Your grill should be used away from wooden overhangs, porches, garages, carports, and the like. Keeping the grill far from your home and flammable objects will reduce the risk of any grill-related accidents. While it may seem like a hassle, cleaning your grill often is one of the best ways to grill safely. When fat and grease build up in the grill, you are inadvertently stoking the fire since it can cause flare-ups. It’s best to clean your grill on the same day once it has completely cooled off so that it’s ready for your next cookout. If you have a gas grill, it is important to make sure that your grill isn’t leaking gas. You can check this by using a solution made with half water and half dish soap. Rub the solution on the connections and hoses. Once you turn the gas on, look to see if soap bubbles form. If you see any bubbles, this is an indication that your hoses have holes in them or your connections are looser than they should be. While decorations around the grill may seem like a great idea for your barbecue, they can quickly turn into fire hazards. Having anything hanging above or near the grill can quickly lead to a fire. 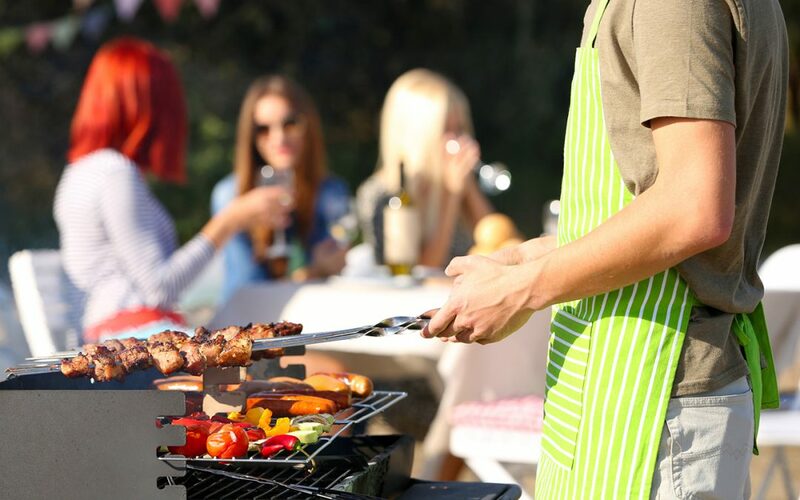 Do your friends and family a favor and keep the grilling area free of any potential hazards. Hopefully, you won’t experience any flare-ups as you grill, but it’s best to prepare for them anyway. Have a spray bottle nearby in case you need to put out any fires. Don’t solely rely on water in the event of an emergency. In a grease fire, water can actually make the situation much worse. Have a fire extinguisher within reach of your grill in case your flare-ups turn into a raging fire. Turning on the gas before you’re ready to grill is a bad idea. If the grill is closed when the gas is on, the gas can build up inside the grill. Once you do open the lid and light it, the fire can roar up in an explosive flame. Grilling is a pretty quick process, so there is no need to pile every inch of your grill with meat. When you do overload your grill, you can cause excessive fat to drip on the flames, leading to major flare-ups. Grill safely this summer and all season long by making the right choices when barbecuing. Use these eight tips as a guide when it comes time for your next backyard barbecue. Cowan Inspections Group provides home inspection services to the Greater Salt Lake City area. Contact us to schedule an appointment.